Magmatic Limited is a bag company from Bristol, UK. 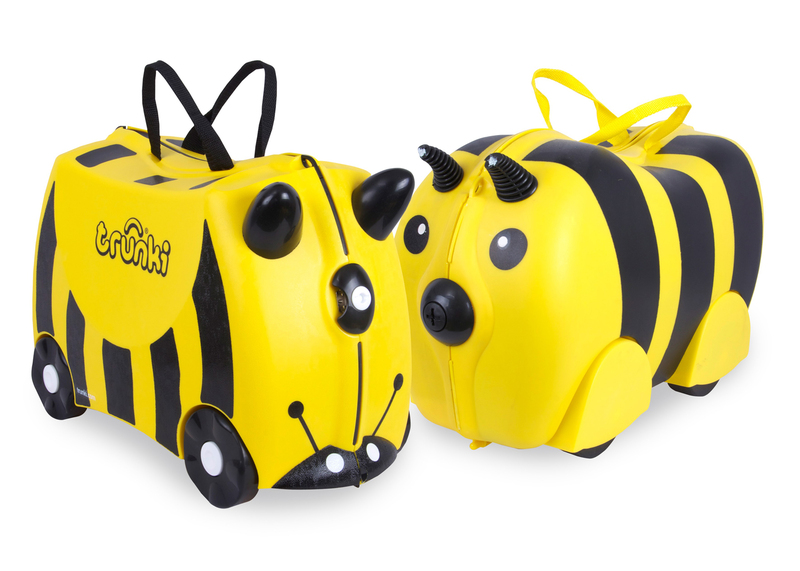 They make Trunki, a popular suitcase for children. The suitcases are popular because they are shaped like an animal, and children can sit on them. Wheels help the Trunki suitcases to move. Two horns mean the child can hold on to the suitcase and steer it. Needless to say, the Trunki suitcase has become an international hit. It has been selling like hot cakes since 2006. Their website proclaims that they have racked up more than 100 awards from nursery, toy, design and business sectors since 2006. Perhaps it was inevitable that the day would come when a competitor spotted the hot-selling Trunki and decided that certain features were worth incorporating. Imitation, after all, is the best form of flattery. The only problem was that it was not all-out copying. It was "inspired by" but distinguishable from the original Trunki. That competitor was PMS International Ltd, a company from Hong Kong. They created the Kiddee Case, which looked sufficiently similar for Rob Law, founder of Magmatic, to get irked and launch a legal action. Magmatic won a high court judgment against PMS in July 2013, but this was overturned in March 2014 by the court of appeal, which ruled that the Kiddee case looked sufficiently different to the Trunki one. ... Law invented the Trunki in 1997 and has sold more than 2m of the ride-on suitcases since 2004. He was turned down by the judges on the BBC show Dragons’ Den in 2006 and left without any investment, but went on to sign a contract with John Lewis. PMS has admitted that its discount cases were inspired by the Trunki. The Trunki design was protected by a community registered design (CRD) that consisted of six representations of the exterior of the case from various angles and perspectives. The court of appeal said this created the impression of a horned animal, whereas the Kiddee case resembled an insect with antennae or an animal with floppy ears. Magmatic’s computer-aided design (Cad) drawings did not show any surface decoration. About 30% of designs across the EU are registered using Cad. The court of appeal ruling meant Cad drawings would no longer be offered the same protection as line drawings, which meant third parties would be able to claim differences in surface decoration should be taken into account, according to the Anti-Copying In Design group. Magmatic has argued that since its drawings did not show any graphical designs on the exterior of the suitcases, the designs on the surface of the Kiddee case had to be ignored. PMS disagreed and contended that they should be taken into account. Source: The Guardian, 3rd November 2015. "Trunki v Kiddee: battle over children's luggage reaches supreme court"
The UK Supreme Court decision, delivered on 9th March 2016, can be found here. According to this PDF judgment, the Supreme Court noted that there were similarities and differences between the two competing designs. It will be noted that in each example, the Kiddee Case is a suitcase with a number of features similar to the CRD; for instance, it is designed to look like an animal, with a wheel at each of its four bottom corners, and has a clasp at the front, and a saddle-shaped top so that it can be ridden on. On the other hand, it has differences from the CRD, such as being brightly coloured (in the first example it has two main colours, namely, red and black, and in the second example it is orange), and with eyes in the front, and (in the first example) a group of large spots or circles towards the rear and (in the second example) stripes and whiskers, and having an unsculptured ridge and covered wheels. There are some aspects of the Kiddee Case which can be said to cut both ways in terms of similarity with the CRD: for instance it has two protuberances at the front, but they are antennae or ears rather than horns, and, while it has a ridge along the front, centre and rear, the ridge has a different shape from that of the CRD. The two-tone colouring of the CRD. The damning conclusion of the judgment at paragraph 55 was: "... the Court of Appeal was right to hold that the design claimed in this case was for a wheeled suitcase in the shape of a horned animal, but that it was not a claim for the shape alone, but for one with a strap, strips and wheels and spokes in a colour (or possibly colours) which contrasted with that of the remainder of the product." Clare Jackman, an IP lawyer at global law firm Norton Rose Fulbright, said it was likely that designers would file a number of applications to protect products in future, rather than relying on just one. Michael Moore, partner and IP lawyer at Marks & Clerk Solicitors says that to maximise protection, where possible, layers of registered design protection should be obtained. For example, this could mean a registered design to protect the product as a whole (eg with line drawings) and a separate design or designs to protect distinctive parts or features of the product. 'Following this case, where possible, companies should in particular consider protecting variations or other embodiments of the design. Significant cost savings can be made if multiple related designs are filed at the same time,' Moore adds. (Source: Small Business UK, 10th March 2016. What does the Trunki patent case mean for small businesses and their IP? Kiddee Case founder Paul Beverley said the ruling was a "victory for fair competition". He said: "It upholds the right of consumers to be able to choose competitively-priced products. "We try always to work within the law and successive courts have agreed that there is no way our popular Kiddee Case can be mistaken for any other product. "In reality we are operating in very different markets from our rivals and we have never been competing for the same customer base." Source: Sky News, 9th March 2016. "Trunki Loses Design Case Against Kiddee Rival"
If you are wondering whether the incident is an isolated one: it isn't. Designs, especially those aesthetically pleasing ones, are often copied. If you are wondering whether it could happen to your design: It could. If you are wondering what you should do next: I recommend getting "layered IP protection", where you could apply for several registrations of the design, on a macro scale and also on a component scale. Since drawings are copyrighted work, you might also like to consider making a deposit of your copyrighted work (relevant drawings) at the MyIPO.